Whether you want to buy something for a fraction of a price, or would like to sell your unwatned items, from televisions, games consoles and jewellery, to household appliances, musical instruments and laptops! 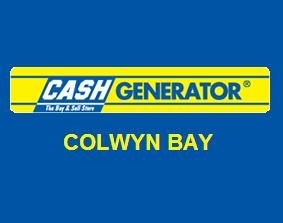 The majority of the products in-store can also be purchased online, so check out the Cash Generator Colwyn Bay website. Not only does the store sell excellent proucts and present those who wisk with instant cash for their, you can also take advantage of the Cheque Cashing, Pay Day Loans, Pawnbroking, Cash for Gold and Money Transfer services in store.